Ticket Prices: Adult $12, Kids $8. 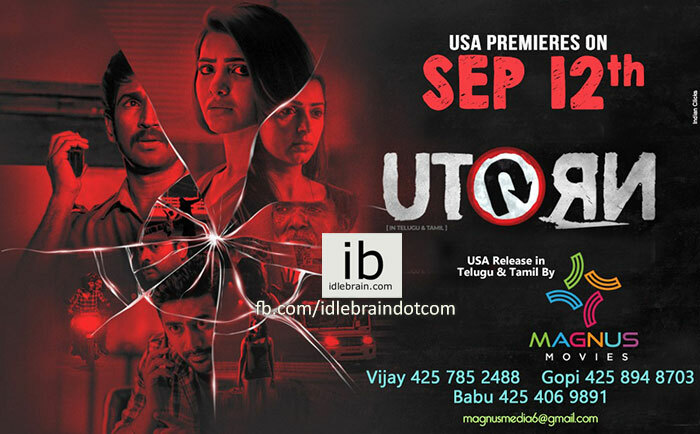 Persisting with our endeavor to support quality projects, Magnus Movies is extremely delighted to announce that we have acquired the USA rights of Samantha Ruth Prabhu-starrer 'U-Turn' for both Tamil and Telugu versions. Samantha holds an unparalleled feat of being the only Indian actress to be part of 14 films that have crossed one million dollar in the USA. In 2018 alone, Samantha has been already part of two supremely successful million dollar movies such as Rangasthalam ($3.5M) and Mahanati ($2.56M). The premieres of the film have been scheduled on September 12th in the USA, a day before the film's official Indian theatrical release on September 13th for the Ganesh Chaturthi weekend. An official remake of Kannada film U-Turn, this Tamil, Telugu bilingual is directed by Sandalwood filmmaker Pawan Kumar, who shot to fame through the blockbuster Lucia. It must be noted that it was Pawan Kumar who helmed the widely-acclaimed original Kannada version of U-Turn. The theatrical trailer of the film, which released a few days back, has grabbed the attention of netizens on social media platforms and received rave reviews. From AR Murugadoss to Anirudh Ravichander, celebrities have showered praise on the trailer and expressed their eagerness to watch the film, which is produced by Chhitturi Venkata Srinivasaa Rao garu & Rambabu Bandaru garu under his home banner Srinivasaa Silver Screen & V.Y. Combines. Also starring Aadhi Pinisetty, Rahul Ravindran, and Bhumika Chawla in important roles, U-Turn marks Samantha's first women-centric film and is eagerly anticipated by her fans. Samantha has walked the extra mile by dubbing in her own voice for the film.